Highbury 1 is a mid-Victorian terraced house in a densely built-up part of Highbury. 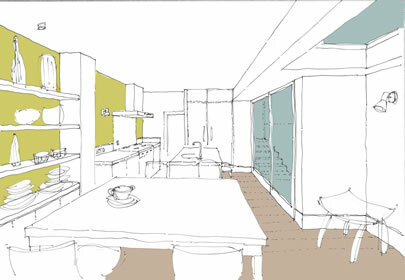 The client's brief was to remodel and minimally extend the rear of the house to create a generous kitchen / dining room whilst retaining a small lightwell to the side. This was achieved by carefully planning the kitchen, storage and dining areas and discreetly concealing ancillary spaces such as utility cupboard and wc, and by introducing large glazed openings to the rear garden and the side lightwell. Polished stainless steel panels and mirrors are strategically placed both internally and externally to maximise natural light into this North facing part of the house. The facades and roof of the extension are clad in dark-coloured standing seam zinc panels.